A current project on London’s Cafe Royal reminded me that I had a wonderful catalogue of paints that were manufactured in the 1930s and that might provide useful source material. 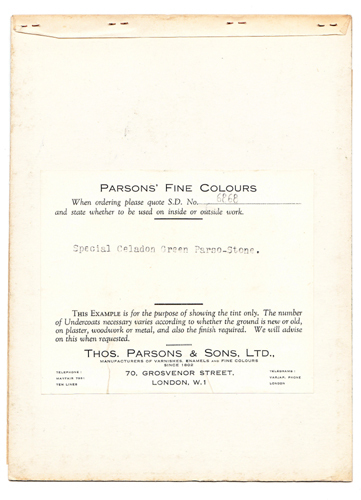 Parsons’ Decorative Finishes is superbly illustrated and provides detailed information on many of the colours and finishes that were popular at that time. In the lobby to the Cafe Royal’s Celestine Room an area of original decoration had been exposed by the removal of a large mirror. 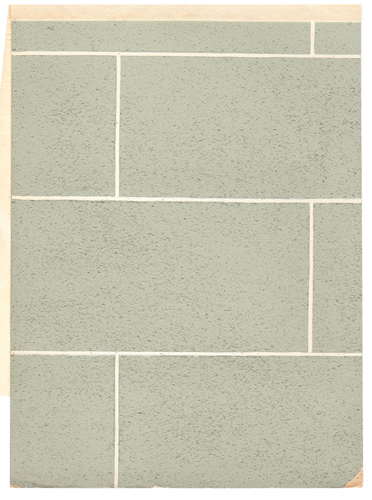 The wall had been coated with a stone-coloured textured paint and lined out to resemble ashlar. 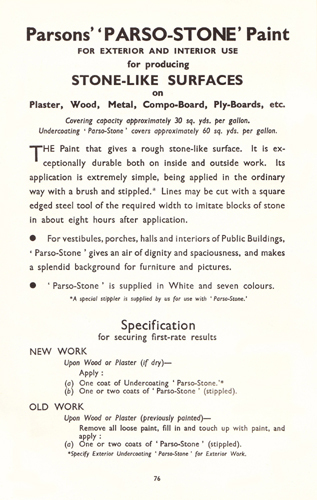 I had remembered that several of the pages of the Parsons’ book featured a product of theirs called Parso-Stone. 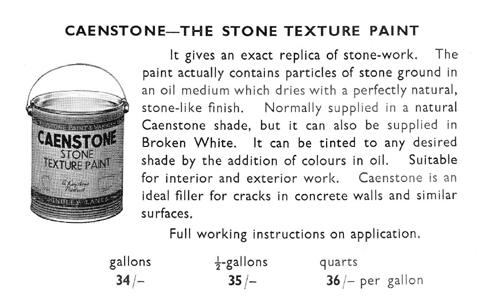 This was a paint that was designed to give a “rough stone-like surface” on interior and exterior walls. It was recommended for “vestibules, porches, halls and interiors of Public Buildings” as it provided “an air of dignity and spaciousness”. 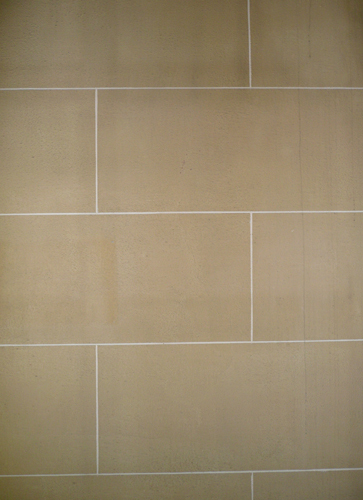 The surface would be given a coat of a special undercoat – in this case Undercoating Parso-Stone – in order to ensure a non-absorbent finish. When this was dry the Parso-Stone itself was applied. The texture was provided by the addition of either silver sand or stone dust and the paint had to be laid on in a thick coating. As this required a great deal of effort and tended to wear brushes out it was frequently applied by spray gun. It couldn’t be thinned as this made it very difficult to ensure even distribution over the whole surface. Once the area had been covered the coating would be stippled in order to remove brush marks and to provide a more stone-like texture. This was done by pounding the wet paint with a Stippler (stippling brush). As a general rule two coats would be given and each of these was stippled. The technique of stippling. NB Another type of handle. 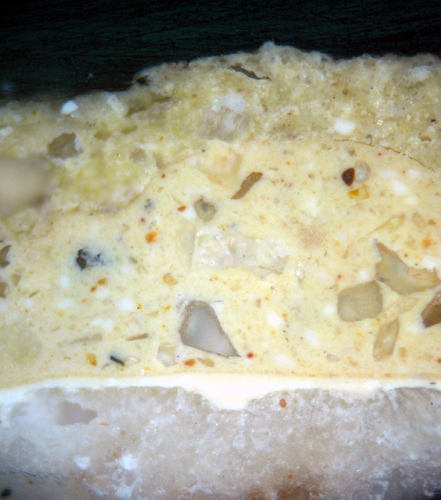 A cross section of the textured paint from the Cafe Royal is shown below. Here it can be seen that two coats had been applied over a primer. In order to imitate mortar joints a straightedge was used. However, as this was done while the second coat of stone paint was still wet a couple of small nails would be driven in at each end of the straightedge, so that they projected about 6mm from the wall (one work recommended using steel gramophone needles). The straight-edge would be rested on these and would be prevented from making actual contact with the paint film. 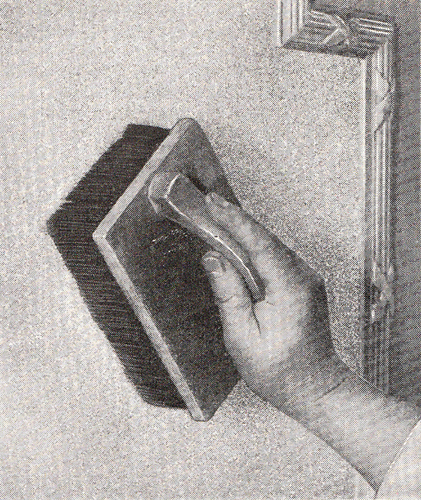 A chisel-pointed stick or screwdriver blade would then be drawn across the wall to scribe a line. Once the paint was dry a thin brush would be used to apply a white line along the scribed surfaces. One of the secrets of producing a convincing effect was to introduce a certain amount of irregularity when the joints were being set out. The combination of appropriate colour and well executed technique provided a very durable and attractive finish. Some years ago, while carrying out the analysis of the 1930s decorative schemes in Eltham Palace, I encountered the same finish on the walls of the ground floor corridor. 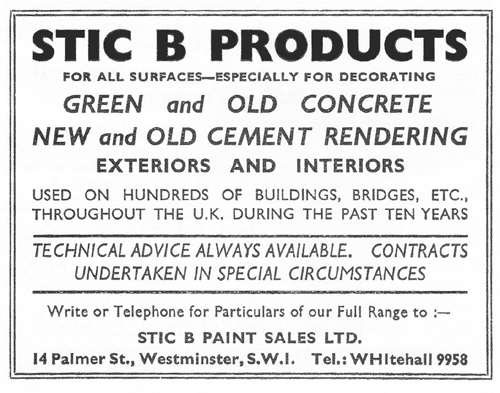 In that instance the original decorating schedule had survived and the imitation stone effect was produced using a product called Stic B. The material of Stic B was analysed for its contents, using the scanning electron microscope. It was found that the bulk of the material was silicon (a large percentage coming from the sand) and calcium (from the chalk). Aluminium and magnesium were present, possibly in the form of hydrated magnesium aluminium silicate (Attapulgite). This latter would have been added as a thixotrope to prevent sagging of the thick, and heavy, paint film on a vertical surface. Small amounts of zinc, barium and sulphur, showed that the material was made opaque and white by the addition of lithopone (a co-precipitate of zinc sulphide and barium sulphate). The use of textured or ‘sanded’ paint has a long history. 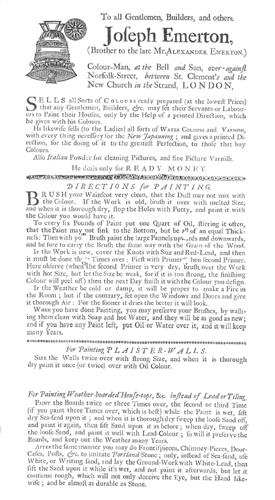 The DIRECTIONS for PAINTING produced in the 1730s by the London colourman, Joseph Emerton, describe how the tops of weather-boarded houses might be protected. Having applied two coats of oil paint a third coat should be applied and while this was still wet dry sea sand should be sifted over the surface. 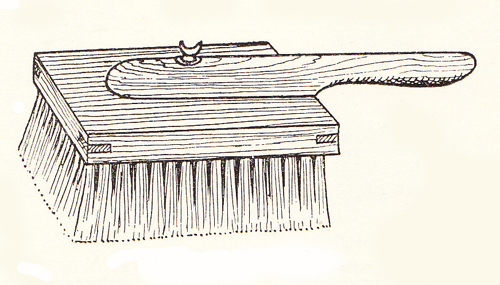 Once dry the excess sand should be swept off and the process repeated. Finally, once the loose sand was brushed away, a coat of lead coloured (grey) paint should be applied. A similar process could be employed to imitate Portland Stone on chimney-pieces; doorcases; posts etc. by using “White, or Writing Sand” (silver sand). I have encountered sanded finishes on a number of projects – notably the walls of the South and North Halls at Wilbury; in the Library at Newhailes, the Chapel in the Royal Hospital, Chelsea and at The Athenaeum. Builders’ price books of the early nineteenth century frequently list sanding as an option and suggest that an extra six pence was charged per square yard treated. 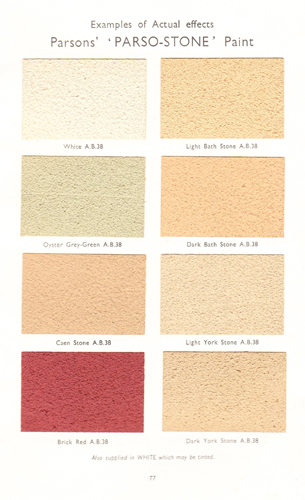 Should anyone want to use any of the paint colours shown on these colour cards Papers and Paints will be able to match them in most conventional finishes.